Hortus Camdenensis | Eupatorium sordidum Less. Half hardy, bushy, rounded shrub with young stems covered in red woolly hairs, opposite, ovate, toothed leaves with red hairs beneath, and terminal corymbs, to 12cm across, of fragrant, violet flowers, mainly in winter. To 3m. [RHSE, Hortus]. 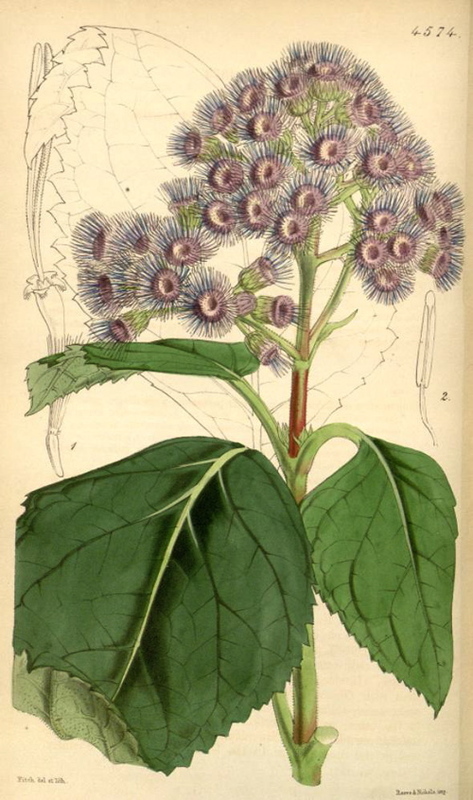 ‘The fine foliage, excellent habit, and large loose spreading heads of light blue flowers, which terminate any shoot of this plant, make it exceedingly attractive, and its season of blooming, winter and early spring, when blue flowers are scarce, merits for it a place in every condition of plants’. [Gard. Chron. 1854]. Introduced to Britain in 1849. [JD]. ‘A soft-wooded suffruticose plant, of easy cultivation. It may be grown in a pot, and flowers freely when not a foot high. Any kind of light open soil will suit it. It has hitherto been treated as a stove-plant; but, judging from its affinity to Ageratum, and from its present appearance, we think that if planted out in the open border in the month of May, it will grow luxuriantly during the summer months. It increases readily by cuttings, treated in the usual way.’ [BM t.4574/1851]. Listed only in the 1857 catalogue [T.341/1857].